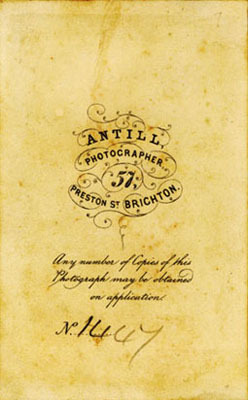 [ABOVE] The reverse of a carte-de-visite portrait by W. S. Antill giving details of his studio at 57 Preston Street, Brighton (c1865). William Samuel Antill, a carver & gilder, was based at 57 Preston Street for over 20 years. 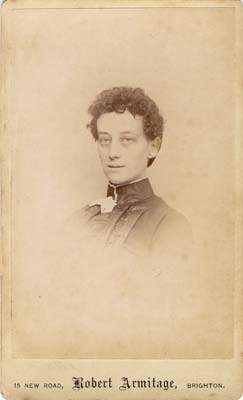 [ABOVE] A portrait of an unknown woman photographed by Robert Armitage of 15 New Road, Brighton (c1890). Five years later Robert Armitage moved his photographic studio to Portland Road in nearby Hove. 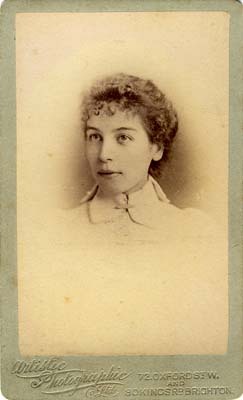 [ABOVE] A portrait of an unknown woman photographed by the Artistic Photographic Company of 80 King's Road, Brighton (c1897). The Artistic Photographic Company had its head office in Oxford Street, London. 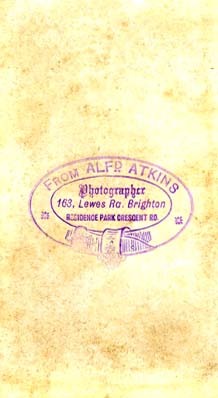 [ABOVE] The trade plate of Alfred Atkins rubber-stamped on the reverse of a carte-de-visite portrait. 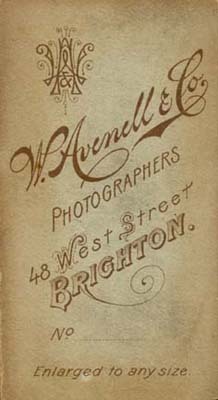 The trade plate gives details of his studio at 163 Lewes Road, Brighton (c1881) [ABOVE] The trade plate of W. Avenell & Co. of 48 West Street, Brighton from the back of a photograph taken around 1900. William Avenell established his studio in Brighton around 1889. 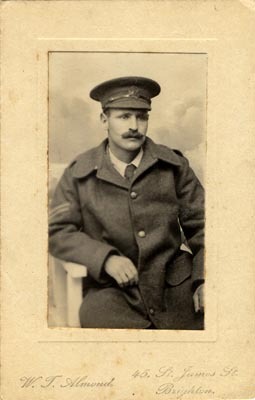 [ABOVE] A portrait of a man in army uniform photographed by W. T. Almond at his studio at 46 St. James Street, Brighton (c1914). William Thomas Almond worked as a professional photographer in Brighton for over 25 years. 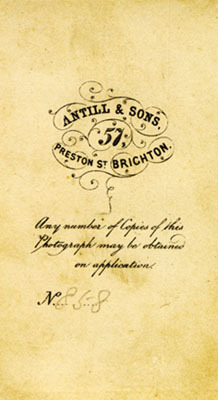 [ABOVE] The trade plate of Antill & Sons, photographers of 57 Preston Street, Brighton as printed on the reverse of a carte-de-visite portrait (c1868). 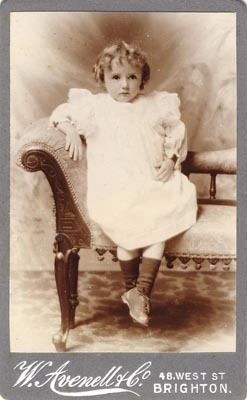 Three of William S. Antill's sons worked as photographers [ABOVE] A carte-de-visite portrait of a young girl photographed at the studio of W. Avenell & Co. at 48 West Street, Brighton (c1890). William Avenell, the proprietor of this photographic studio was instrumental in establishing the soccer team Brighton United. 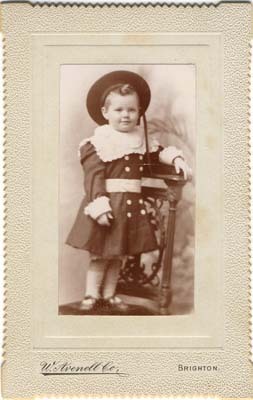 [ABOVE] A carte-de-visite portrait of a young boy photographed at the studio of W. Avenell & Co. at 48 West Street, Brighton (c1902). William Avenell was a professional photographer who helped establish the Brighton United football team in the late 1890s. 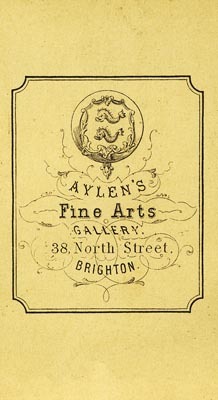 [ABOVE] The trade plate of Aylen's Fine Arts Gallery of 38 North Street, Brighton as printed on the reverse of a carte-de-visite view (c1870). Samuel Aylen published a series of topographical cdvs around 1870.